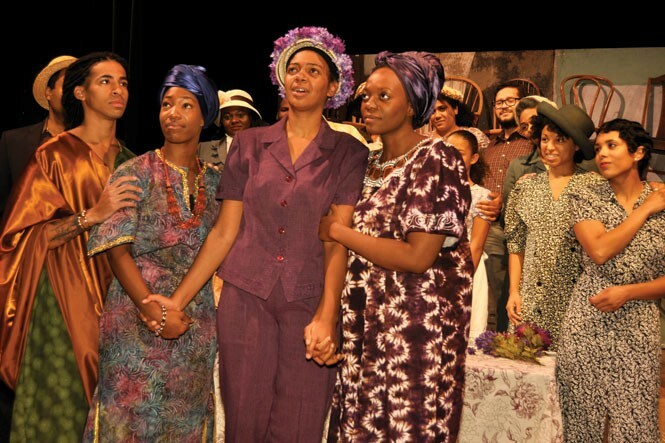 Wasatch Theatre Company's production of The Color Purple makes excellent use of its space, the Studio Theatre at the Rose Wagner Center. It takes a while for some of the staging choices to make sense—after the opening church number, a lot of the first half seems a bit cramped—but by the end of the show, the intimacy of the small space and thrust stage lend a power to the material that the initial adaptation from novel to feature film lost. The Broadway musical has advantages over the film version, such as restoring the queerness, which the movie buried as deep subtext. And Wasatch Theatre's production renders that material vividly, with electric chemistry between Latoya Rhodes' Celie and Melinda Money's Shug. The performances all around are raw, intense and deeply felt, particularly Rhodes' and Erika Richardson's work as Sophia. Its biggest strength, though, is realizing the importance of a bravura finale; the final number got a standing ovation from the audience, and deservedly so. This production's second half is considerably stronger than the first—which is partly the material, and partly a greater focus in the staging, with far less business requiring the entire cast to share the small stage at any given moment. In any case, it's a nice bit of coincidental symmetry that, as things get better for Celie, so do things get better for the show as a whole. 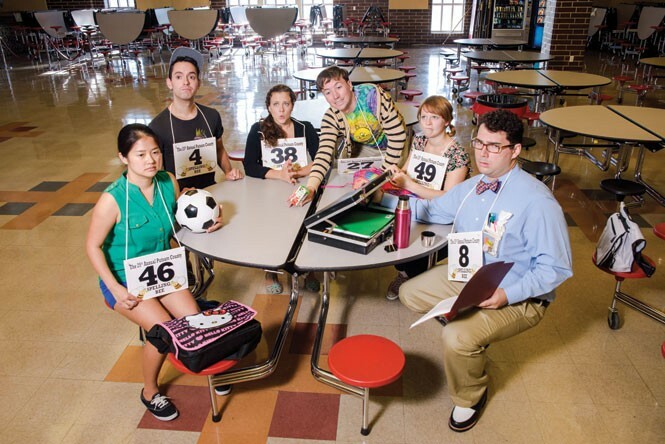 The enormous commercial success of The 25th Annual Putnam County Spelling Bee has always been a bit odd, as the concept and core structure of the show feel very sui generis mid-'00s downtown NYC theater. That was a time and place where audience-participation shows were very much in vogue, as were Putnam County's kind of gentle heartland satire and non sequitur humor. Seeing the show in a theater in Utah that seats almost a thousand feels a bit like it's being beamed in from another planet—but only a bit. The success and longstanding reputation of the show's Broadway incarnation help bridge the interplanetary gap, and Pioneer Theatre Company's production is top-notch, particularly with regard to design. The show is still hamstrung a bit visually by the spelling-bee setting and premise; no matter how creative a director gets with the blocking, it's still a show that consists extensively of actors standing up to spell a word and then sitting back down. As Achilles' heels go, though, that's a mild one, and one well-compensated for by the cute, clever songs and—in this particular case—Karen Azenberg's direction and the cast's energy and skill. The resultant buoyancy and near-complete absence of meanness serve as a reminder that, however one wishes to romanticize the hip, edgy world of independent, low-budget art, some material is better served by sunnier, more inclusive commercial treatments—which is why this particular Putnam County is its ideal incarnation. 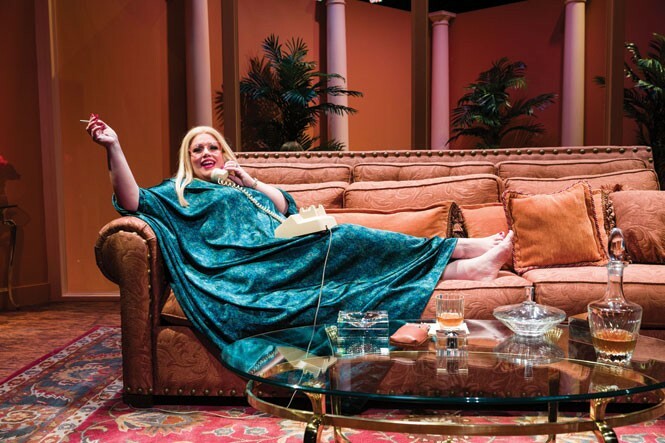 Salt Lake Acting Company's production of I'll Eat You Last: A Chat With Sue Mengers feels less like a one-woman play—which it is—than it does Camille Van Wagoner's Mengers holding court for a random group of strangers in her living room. The staging and Van Wagoner's performance lend a remarkable air of intimacy, as does the device of the star selecting an audience member to do favors for her. The text is less remarkable, but still solid. John Logan—better known as the screenwriter of Skyfall, Hugo, The Aviator and more—lays out a portrait of a Hollywood lost to history through the perspective of Hollywood's first woman "super agent"; Mengers represented Gene Hackman, Faye Dunaway and, most notably and inextricably, Barbra Streisand. Compounding that sense of nostalgia in 2014 is that the "good old days" Mengers pines for in I'll Eat You Last have been eclipsed by the 1980s, source of so much of today's pop-cultural nostalgia. Since the text is pitched at an audience whose narrator assumes a certain degree of insider knowledge, a lot of references come flying, but Van Wagoner does an excellent job of ensuring those references are never empty text. That care is but one part in a terrific bit of stage acting, all the more impressive for being compelling physically while Van Wagoner sits or lounges almost the whole show. I'll Eat You Last is a diverting, brisk 90 minutes, especially recommended to movie fans.